Blue Devils completed another undefeated season by adding to their spread over Carolina Crown, while each of the corps won four captions. The only change in placements between Semifinals and Finals was with Boston Crusaders passing up Cavaliers. There were five special awards presented during the awards ceremony, each averaged after combining the scores from Prelims, Semifinals and Finals. The George Zingali Award for Best Color Guard went to Blue Devils. There was a tie for the John Brazale Best Visual Performance Award, between Blue Devils and Carolina Crown. The Jim Ott Award for Best Brass Performance went to Carolina Crown and the Fred Sanford Award for Best Percussion Performance was earned by Blue Devils, who also won the Don Angelica Award for Best Overall General Effect. A short reminder that only the two Effect captions are added to the each corps' final score without first being divided in half. Therefore, a 0.50 difference in any of the Visual or Music captions amounts to 0.25 in the final score. View the complete recap of scores from this event. Blue Devils (1st–98.70, up 0.50 from Semifinals) received perfect scores from both Visual Effect judges, beating Crown by 0.45 in that caption. This more than made up for a 0.15 deficit to Crown in Music Effect, adding up to a 0.35 spread in Total Effect. The corps also earned perfect scores in Visual Analysis and Color Guard, allowing the corps to take a 0.50 advantage in Total Visual. To top off the winning captions, BD scored a full point above Crown's 6th place Percussion score, and by staying close to Crown's winning captions in the other two Music captions, was able to win Total Music by 0.25, giving the corps a sweep in Total Effect, Visual and Music. Carolina Crown (2nd–97.65, up 0.20 from Semifinals) won Music Effect, Visual Proficiency, Brass and Music Analysis. The corps was 2nd in Visual Effect, 3rd in Visual Analysis and Color Guard and 6th in Percussion, down from 4th in Semis. Phantom Regiment (3rd-96.55, 0.75 up from Semis) was 2nd in Visual Analysis and Color Guard, but still placed 3rd in Total Visual due to being third in Visual Proficiency. Other 3rd place captions were Visual and Music Effect, Brass and Music Analysis, with Percussion taking 7th as the line did in Semifinals. The Cadets (4th-95.05, up 0.95) moved up to 3rd in Percussion and were 4th in Music Effect, Visual Analysis, Brass and Music Analysis and 5th in the remaining three captions. Santa Clara Vanguard (5th-94.45, up 0.75) finished 4th in Visual Effect, Visual Proficiency, Color Guard and Percussion, 5th in Music Effect and Visual Analysis and 6th in Brass and Music Analysis. 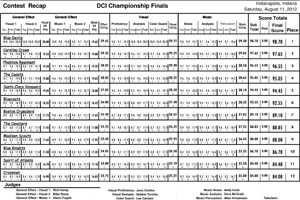 Bluecoats (6th-92.55, down 0.25) moved up to 2nd in Percussion, just 0.20 under BD. Brass and Music Analysis finished in 5th, Visual Analysis 8th and the other four captions ended in 6th. Boston Crusaders (7th-89.10, down 0.20) was 6th in Visual Analysis, 7th in Visual Effect, Color Guard, Brass and Music Analysis, 8th in Percussion and 9th in Music Effect and Visual Proficiency. The Cavaliers (8th-88.85, down 0.55) placed 5th in Percussion, 7th in Visual Proficiency, 8th in Music Effect, Brass and Music Analysis, 9th in Color Guard and 10th in Visual Effect and Visual Analysis. Madison Scouts (9th-88.00, down 0.80) was 6th in Visual Effect, 7th in Music Effect, 9th in Visual Analysis and all three Music captions, 10th in Visual Proficiency and 11th in Color Guard. Blue Knights (10th-87.70, up 0.05) was 7th in Visual Analysis, 8th in Visual Proficiency and Color Guard, 9th in Visual Effect, 10th in Music Effect and Percussion, 11th in Music Analysis and 12th in Brass. Spirit of Atlanta (11th-84.40, 1.25 down) was 10th in Color Guard, Brass and Music Analysis, 11th in Music Effect and Percussion and 12th in the remaining three captions. Crossmen (12th-84.00, 0.90 down) was 11th in Visual Effect, Visual Proficiency and Analysis, and Brass, and 12th in the other four captions. Read more about the results from this event.